Building a conventional hunting cabin is expensive, and the cost of insurance can make an RV out of reach financially. A better solution could be a hunting cabin container for a number of reasons. One of the biggest advantages to a hunting cabin container is the fact that it is portable. This feature is especially desirable if you lease hunting land, as you can simply pack up your container and take it with you when your lease is up. You’ll also appreciate portability if you regularly hunt in several different areas, but do not wish to build a permanent structure everywhere you hunt. A shipping container is highly customizable, allowing you to add features such as a covered front porch, windows, or a traditional door to make your container feel more homelike. You may also divide your container into separate areas for cooking and sleeping to ensure you have adequate privacy. 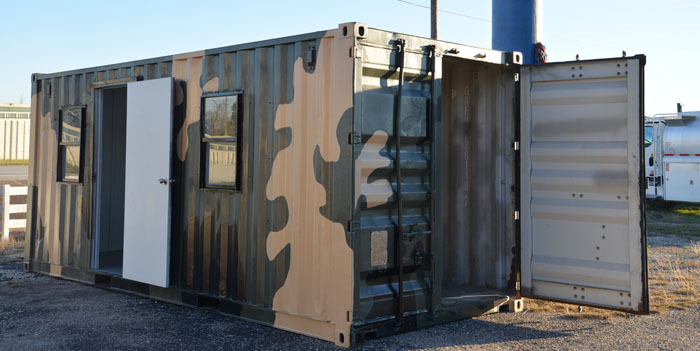 Whether you are looking for a cabin that will provide you with protection against the weather, or in need of more comfortable camping accommodations, one of our shipping containers can easily fit the bill. Our sturdy steel containers are meant to withstand even the harshest elements. While winds outside roar, you’ll barely feel a breeze while tucked safely inside your hunting cabin container. Its solid steel construction is also fireproof, making it ideal for locations that are prone to wildfires. You’ll find the tightly-sealed roof provides ample protection from leaks, even during the most severe downpours. The odds of a container cabin being damaged from falling tree limbs is extremely low, making it one of the safest places to ride out a heavy storm. These are just a few advantages you could realize from a hunting cabin container. To find out more, contact GOContainers today!.